STEERING WHEEL & HORN REMOVAL article. On models with A/T, place selector lever in "PARK"
Using Plate Compressor (J-23653-A), compress lock plate. NOTE: The lock plate is under strong spring tension. DO NOT attempt to remove snap ring without using lock plate compressor. spring, spring seat and bearing race (thrust washer on some models). Depress hazard warning switch while unscrewing from column. harness. Tape a string to harness to aid in removal. STEERING WHEEL & HORN REMOVAL article. Remove turn signal switch. cylinder (clockwise) 2 detent positions beyond the "OFF/LOCK"
position. On models with tilt column, turn lock cylinder to "LOCK"
remove lock cylinder from housing. See Fig. 1. Push lock cylinder inward until it contacts lock sector. cylinder. Turn cylinder to "OFF-UNLOCK" position. Disconnect switch from remote rod. Disconnect harness connectors at switch. Remove switch. Move switch slider to "ACC" position. Engage remote rod in switch slider. Position switch on column, taking care not to move slider. Hold key in "ACC" position while pushing switch down slightly to remove slack in actuator rod. Install attaching screws. Connect harness connectors. Remove lower instrument panel trim panel. 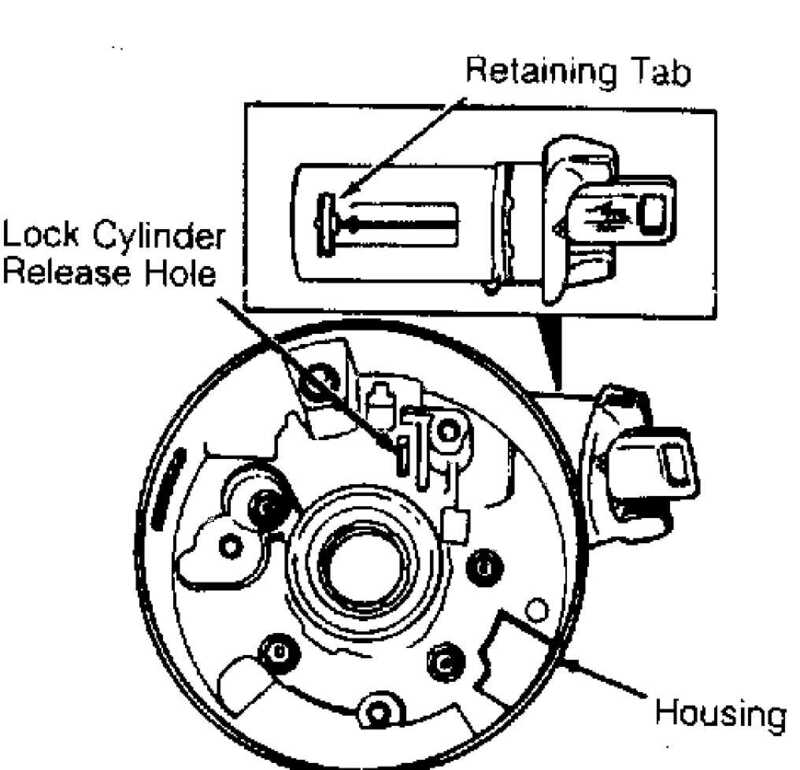 Insert key in lock cylinder. Turn cylinder 2 positions beyond the "OFF-UNLOCK" position. Disconnect switch from remote rod. Disconnect harness connectors at switch. Remove switch. Move switch slider to "ACC" position. Move switch slider back 2 clicks to "OFF-UNLOCK" position. Engage remote rod in switch slider. Position switch on column. DO NOT move slider while positioning switch. Install attaching screws. Connect harness connectors. Refer to TROUBLE SHOOTING GENERAL TROUBLE SHOOTING section.